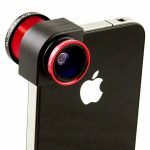 • “Olloclip” is a $100 two-in-one telephoto lens for iPhone 4 and up, from BiteMyApple.co. The Olloclip has a lot of neat tricks. It reduces glare, magnifies images, and it lets you get twice as close to your subject. If you choose “selective focus,” the subject stands out against the background. Using the glare reducer prevents a washed-out look. • “Luxi” is a dome that fits over the iPhone’s camera to turn it into a light meter for your DSLR camera. That means you don’t have to carry one extra thing to get the right exposure. The camera’s built-in light meter shows the right setting for an object or a whole scene, but sunset portraits and pictures with strong back-lighting need a regular light meter. The Luxi is $25 from esDevices.com. • The recently released QX-10 and QX-100 lens attachments from Sony provide zooming, image stabilization and software for sending out the photos. Prices are $250-$500 – as much as the phones themselves.